New Rochelle, NY, October 11, 2018–In a new study researchers have developed a two-pronged approach for targeting Ebola virus infection using linked nucleic acid (LNA) antisense oligonucleotides (ASOs)designed to interfere both genes essential for translation of Ebola virus genes and to block production of an intracellular human protein needed for the virus to enter cells. The results of using LNA ASOs to interfere with critical Ebola genes and host proteins are published in Nucleic Acid Therapeutics, a peer-reviewed journal from Mary Ann Liebert, Inc. publishers. 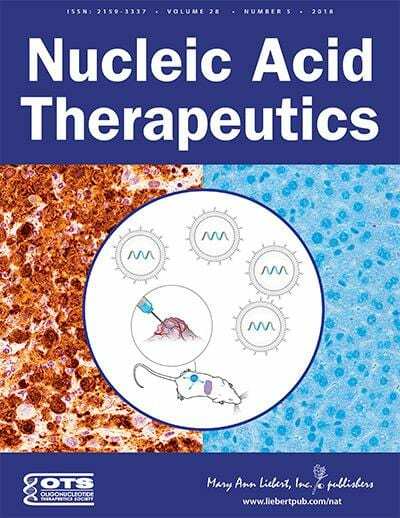 The full-text article is available free on the Nucleic Acid Therapeutics website through November 11, 2018 at https://www.liebertpub.com/doi/10.1089/nat.2018.0722. The researchers described the distinct applications of LNA ASOs for this application. They demonstrated effective targeting of two Ebola viral genes -NP and VP24 – which promote Ebola replication and inhibit a proper immune response against the virus, respectively. They also showed the ability to use LNA ASOs to prevent Ebola infectivity via a pathway that requires the host protein Niemann-Pick C1 (NPC1).